It’s time for this blog’s longest running tradition! (Okay, the only tradition, if we’re honest.) 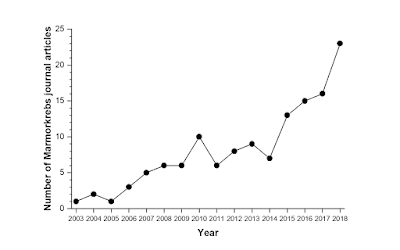 It’s the eleventh annual look at trends in Marmorkrebs publishing! A barnstormer of a bumper crop of a year that was much busier than any before. But 2016 comes out on top because a single book dropped with a bunch of articles on Marmorkrebs. But several of those were reviews, and that they all came out in one volume meant it felt like one event instead of nine. 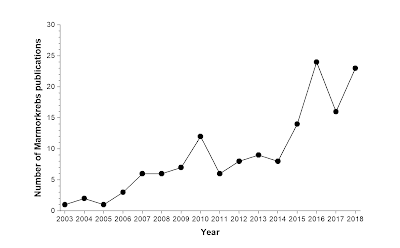 Honestly, I think the activity in Marmorkrebs papers coming out in journals is a better indicator of the expansion of the field. Announcing the sequencing of the Marmorkrebs genome, the first for a decapod crustacean. Documenting the spread of Marmorkrebs in Madagascar since their detection about a decade earlier. What was strange, though, was that almost none of the news coverage (of which there was a lot) focused on either of those two things. 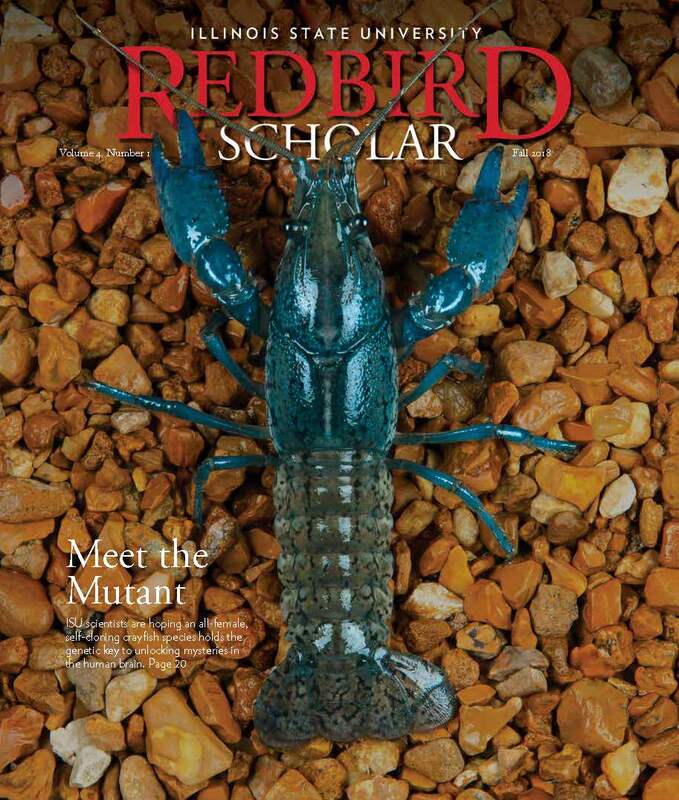 Most focused on the fact that cloning crayfish were a thing, which we have known from 2003. Some focused on the invasive nature of Marmorkrebs, but tended to talk about their spread in Europe rather than Madagascar. 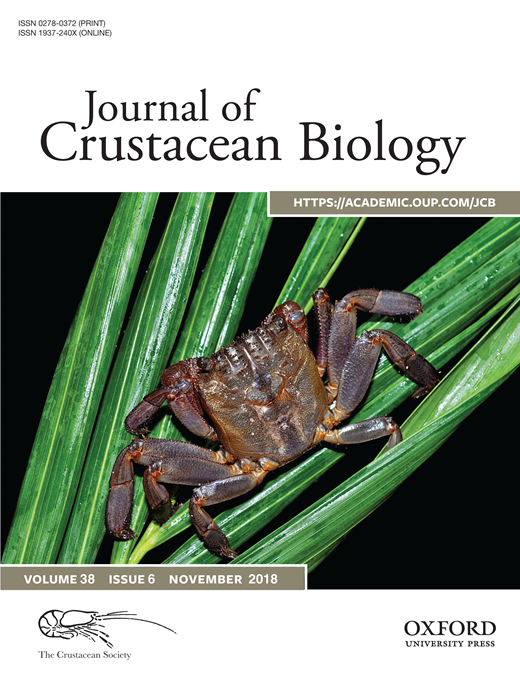 Having the first decapod crustacean genome, which might have been the biggest long term result from this paper, was very underplayed. Another trend was researchers started to adopt the name Procambarus virginalis, after the name was proposed three years ago. 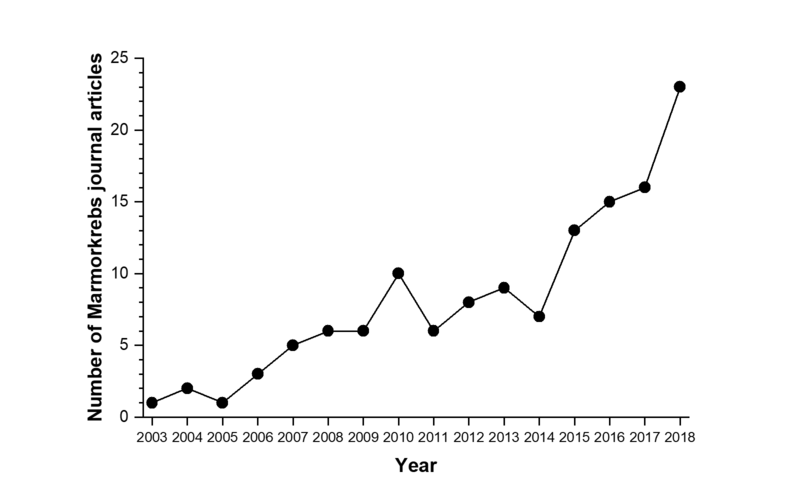 The initial 2015 proposal was a “naked name” (nomen nuden in taxonomic lingo) with none of the typical descriptive work to accompany the new Linnean name, and the community generally used Procambarus fallax forma virginalis in 2016 and 2017. But having a proper taxonomic paper published in 2017 seems to have turned the tide, and P. virginalis seems to now be the accepted name in the community. 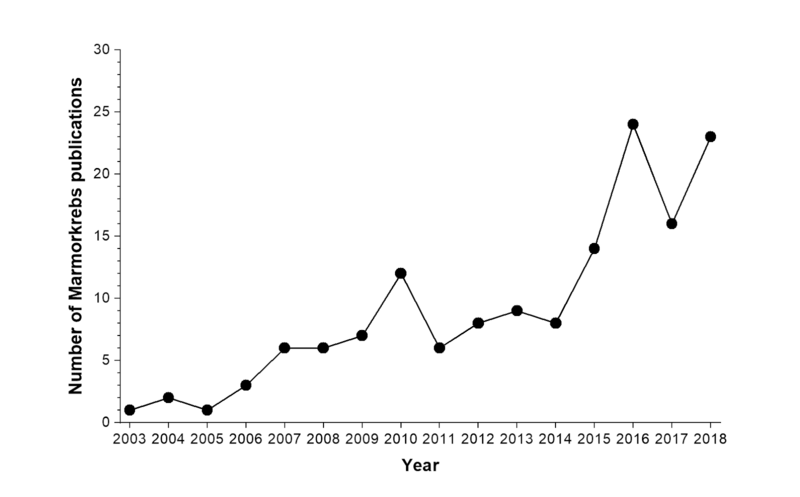 With the trendline continuing to head up, and two papers with 2019 cover dates already out, the state of Marmorkrebs research is strong. 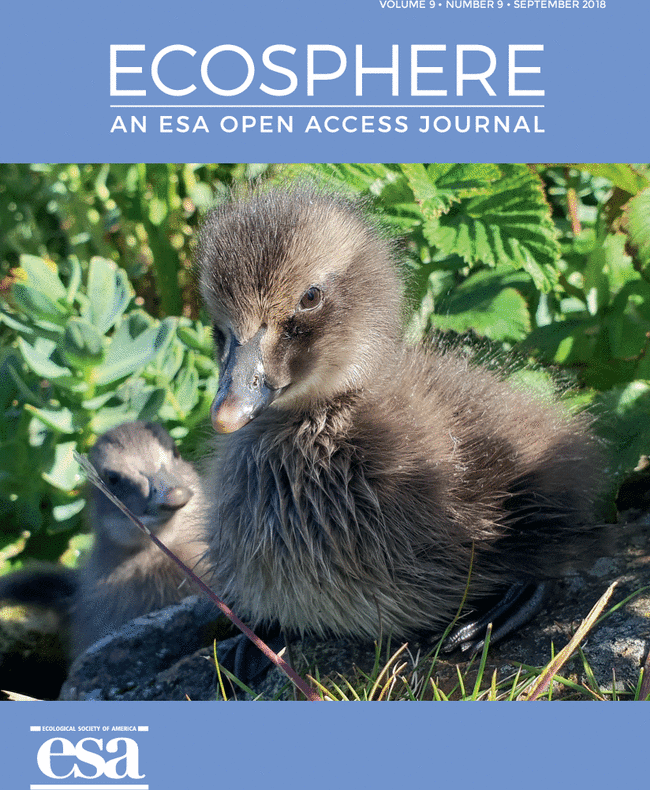 Ecosystems increasingly face concurrent invasions by multiple species, but knowledge about relationships among invasive species is under studied. 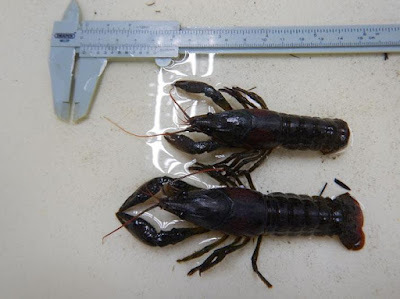 We examined agonistic encounters among signal crayfish Pacifastacus leniusculus, marbled crayfish Procambarus virginalis, and the common yabby Cherax destructor, none native to Europe, to assess the influence of aggression on their success in a sympatric environment. In interspecific interactions, similar-sized signal crayfish were significantly more likely to initiate aggressive encounters and won significantly more fights against similar-sized opponents. 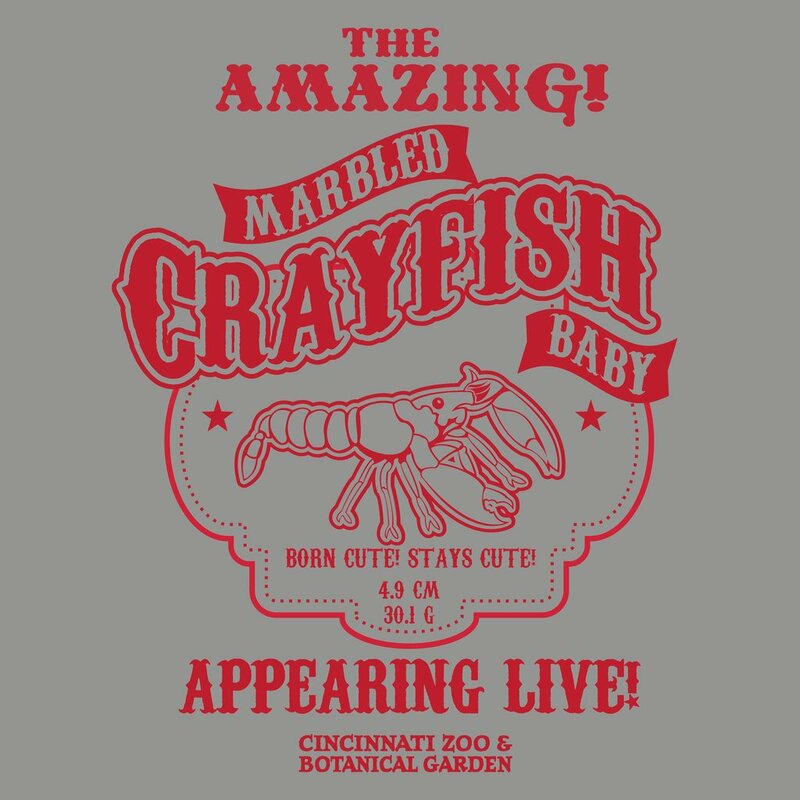 The marbled crayfish was the least aggressive and least successful in agonistic interactions. 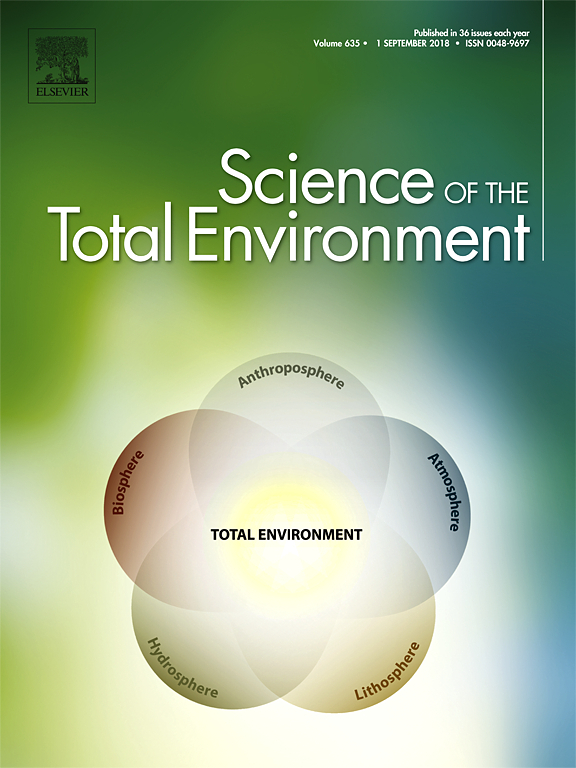 The mean number of fights, fight duration, and number and duration of low and high intensity fights varied significantly between intra- and inter-specific interactions, tending to be more pronounced in conspecific encounters. We concluded that crayfish species differ in fighting strategies employed during intra- and inter-specific interactions. Of the species evaluated, the signal crayfish shows the highest potential to establish dominance. However, factors such as growth rate, reproductive potential, ecosystem variables, and temperature of habitat may alter the competitiveness of an invader. The educational publication contains microphotographs and description of histological preparations of the structure of marbled crayfish. The above materials may be used both for carrying out laboratory work on disciplines “Histology”, “Cytology”, “Cell Biology”, “Special Practice”, and for self-study of relevant educational topics. Designed for specialists in the field of hydrobiology and histology, students and graduate students of institutions of higher education who studying in the field of “091 Biology”, “207 Water bioresources and aquaculture” and “162 Biotechnology and bioengineering”. 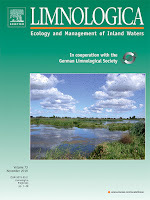 The publication contains the results of studies conducted by President’s of Ukraine grant for competitive projects Ф75/142 «The reproductive potential of invasive species of Dnieper region reservoirs and their impact on bioproductivity formation» (№ 0118U006319) of the State Fund for Fundamental Research. Invasive species can cause significant changes in local and regional ecologies, especially in freshwater ecosystems. It is thus important to monitor and document the spread of non-indigenous species to such habitats as such information can be critical to preserving habitats and species. We document the spread of the red swamp crayfish Procambarus clarkii (Girard, 1852) (Cambaridae), a highly invasive non-indigenous species, in Malta and south Sicily. We also document the first records of other non-indigenous decapods important in the pet trade or in aquaculture, Procambarus virginalis Lyko, 2017 (Cambaridae), Pontastacus leptodactylus (Eschscholtz, 1823) (Astacidae), Cherax quadricarinatus von Martens, 1868 (Parastacidae), Pacifastacus leniusculus (Dana, 1852) (Astacidae), and Atyopsis moluccensis (De Haan, 1849 (Atyidae) from freshwater localities in the Maltese Archipelago and Cherax destructor Clark, 1936 (Parastacidae) from southeastern Sicily. The study provides recommendations on the adoption of control measures by the competent national authorities with respect to these non-indigenous species. The obligately parthenogenetic marbled crayfish, Procambarus virginalis, is the first formally described asexual species of the Crustacea Decapoda. It is a triploid descendant of the sexually reproducing slough crayfish, Procambarus fallax. Here we describe the morphology of cultured and wild marbled crayfish of wide size ranges in detail and photodocument all taxonomically relevant characters. 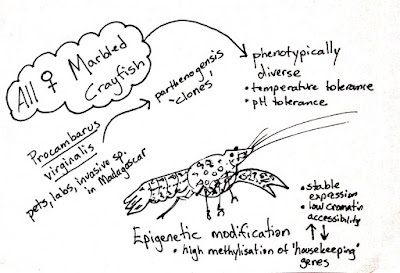 Some morphological traits and coloration showed considerable variation within populations despite the monoclonal nature of marbled crayfish. There were also significant differences between wild and laboratory populations with respect to body proportions, coloration and spination. Comparison with Procambarus fallax revealed no qualitative morphological characters that unambiguously identify the marbled crayfish. Analysis of the mitochondrial cytochrome c oxidase subunit I gene (COI) and nuclear microsatellites of marbled crayfish and Procambarus fallax from different sources indicated that the tri-allelic microsatellite PclG-02 is better suitable than COI to identify the marbled crayfish. A respective identification key is provided. The COI and microsatellites of Procambarus fallax from different areas of Florida and southern Georgia suggest that the parents of the first marbled crayfish may have come from northern Union County, northern Florida. Presumably, a couple of legs are being held under the body. And I wouldn’t trust this page for taxonomic information, as the authority given for Marmorkrebs is incorrect. Not sure how easy it is to fix that. Update, 9 November 2018: It’s fixed on both counts! Woohoo! New link for new image is here. Arthropods are the most species-rich taxon within Metazoa and have gone through major evolutionary changes with regard to body organization. Arthropod hearts and their associated vascular systems are thus morphologically highly disparate: while some arthropods exhibit very powerful hearts and complex vascular systems, other arthropods do not possess any kind of vascular system or heart at all. A comprehensive study investigating the structure of arthropods hearts has never been undertaken. In this study, we therefore investigate the hearts of 34 species from all major arthropod groups using various imaging techniques (confocal laser scanning microscopy, micro-computed tomography, histology) and describe them by addressing different aspects of heart morphology, e.g. the structure of the myocard or the composition of ostia. In a next step, we conceptualize 18 characters related to heart morphology and their respective character states and–using additional data from the literature–score a matrix for a total of 45 species from 38 supraspecific taxa. We map the characters onto prevailing phylogenetic hypotheses and perform parsimony-based ancestral state reconstruction to trace the evolutionary transformations undergone by arthropod hearts. An exploration of the character concepts (as explanatory hypotheses) reveals ontological peculiarities of character statements that clearly distinguish them in terms of ontological status from descriptive statements (i.e. descriptions of morphemes). The implications of these findings influence the interpretation of ground patterns as explanations. This first phylogenetic approach to heart morphology in the arthropod ground pattern reveals numerous new putative synapomorphies and leads to a reconsideration of the morphology of circulatory systems in early arthropods. 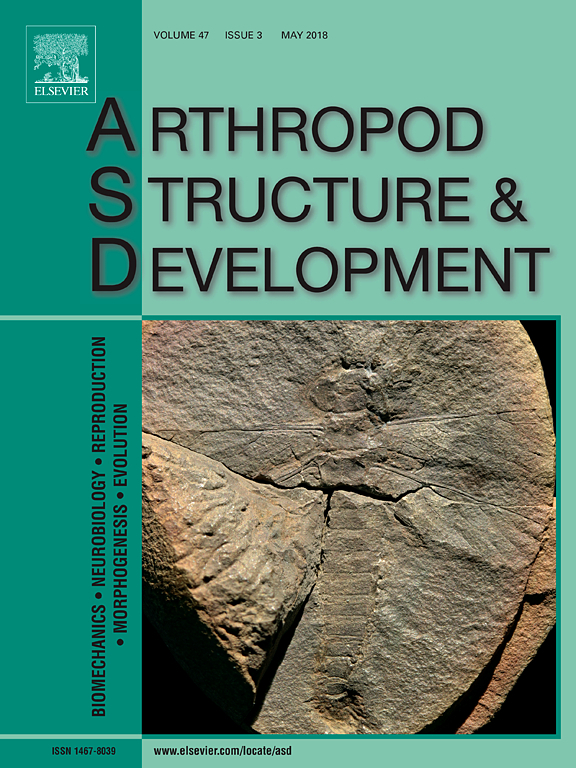 Hypotheses on the evolution of hearts in (Pan-) Arthropoda are illustrated and discussed. I mentioned a couple of weeks back that an American man had been convicted for selling and exporting crayfish as pets. Another case came to attention recently. An Australian man was convicted and fined AUD$8,550 for catching the world’s largest freshwater invertebrate, Astacopsis gouldii. The crayfish is threatened and protected by law. I mention this because protecting invertebrates is hard, and law enforcement on this sort of issue is rare. It’s encouraging to see. New species often invade ecosystems already dominated by previous invaders. Ornamental freshwater crayfish, particularly parthenogenetic marbled crayfish (Procambarus virginalis), increasingly establish in European water bodies where they interact with resident native and non-native species. 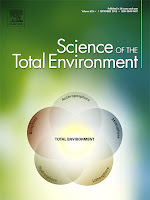 Behavioral traits and behavioral syndromes can influence the outcome of these species interactions. 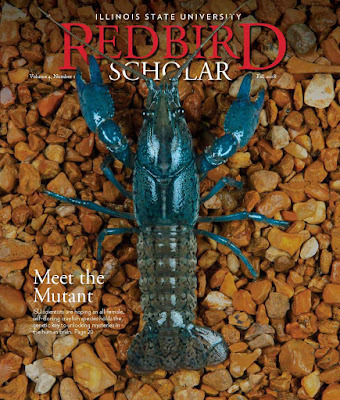 The behavior of non-native crayfish is often studied in notorious invaders but rarely in new and emerging species, although those provide the best opportunity for management. 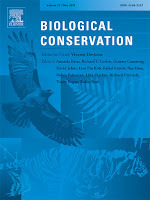 Activity, aggressiveness, and boldness have repeatedly been associated with invasion success and species displacement. Further, crayfish can adapt their behavior after they have established in the new range. We investigated whether marbled crayfish can displace the widely established spiny-cheek crayfish (Orconectes limosus). 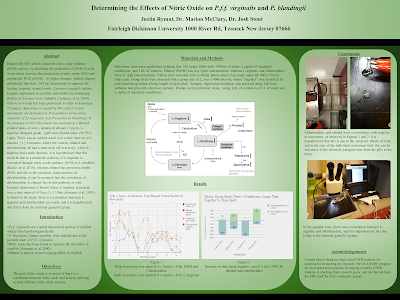 Specifically, we compared their behavioral traits and evaluated whether these traits differ, using marbled crayfish populations from aquaria and the field and spiny-cheek crayfish from the field.We staged agonistic encounters, measured activity levels, and recorded the response to a simulated threat of both species and both origins (field and aquarium) in laboratory trials. We found that in agonistic encounters, marbled crayfish were on average more aggressive than spiny-cheek crayfish, even against larger opponents. Aggressiveness and activity were positively correlated, which is indicative for an aggression syndrome. Marbled crayfish from the field were less active than those from aquaria, but there was no difference in aggressiveness. Marbled crayfish often froze in response to a simulated threat, whereas spiny-cheek crayfish reacted either offensively or defensively. 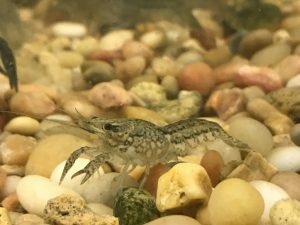 These results from the laboratory illustrate potentially important behavioral mechanisms behind crayfish over-invasions and show behavioral plasticity in a species where all known individuals are genetically identical. 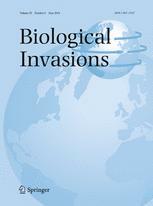 To better understand the invasion process in nature, the species’ reproductive biology and interactions with other members of the community should be considered. 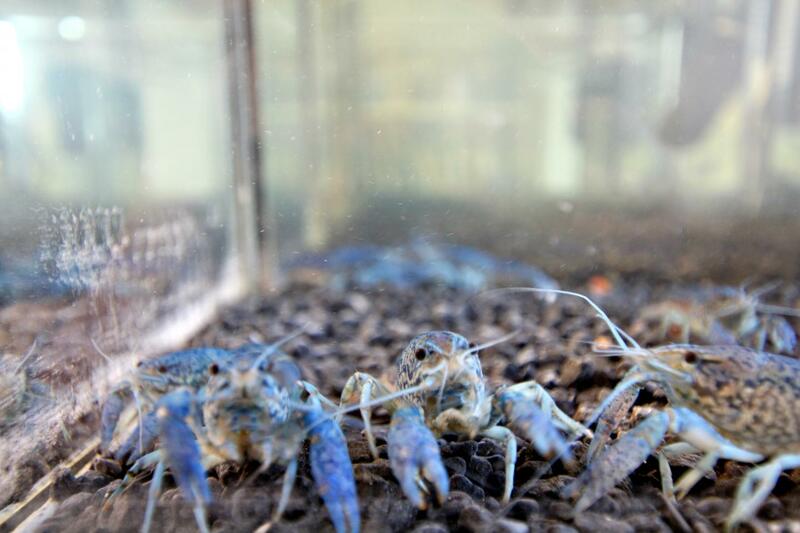 We conclude that the recent success of marbled crayfish in establishing new populations could be influenced by their behavioral flexibility and their potential to competitively persist in the presence of established invasive crayfish. It was Germany, then Italy, then the Netherlands, then Hungary, then Croatia, then Slovakia, then Romania, then Sweden, then the Ukraine, then the Czech Republic, then Estonia, and now Malta. Malta makes it an even dozen European countries where Marmorkrebs have been found in outdoors, according to a paper in press from Deidun and colleagues. This is not a few stray individuals, either. Some sites (visited in 2016 and 2017) had hundreds of individuals. I will add the paper to the collection of abstract on the blog once the final paginated version is published. I have updated the map of Marmorkrebs introductions accordingly. My only consolation is that at some point, I’m going to run out of European countries to add to the list. Marmorkrebs will be in all of them. Nice cover accompanying this blog post. 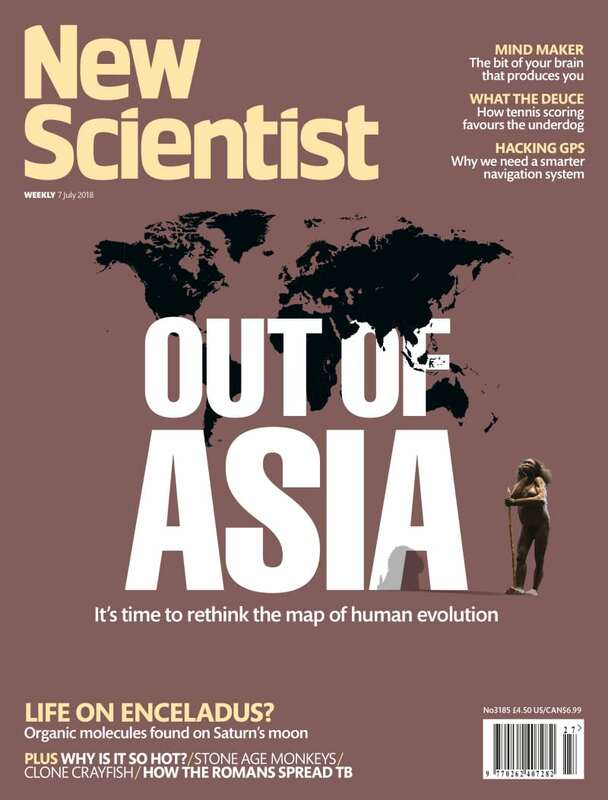 It’s covering the Marmorkrebs genome paper that came out back in February, but better late than never! The photo is aces in any case. Pierce sold over $19,000 worth of crayfish illegally, and for this, he got a $500 fine, 20 hours of community service, and a year on probation. By my quick scan of the act, he could have received jail time and thousands of dollars in fines. (T)his will result in my disqualification of future employment in areas related to wildlife and conservation. 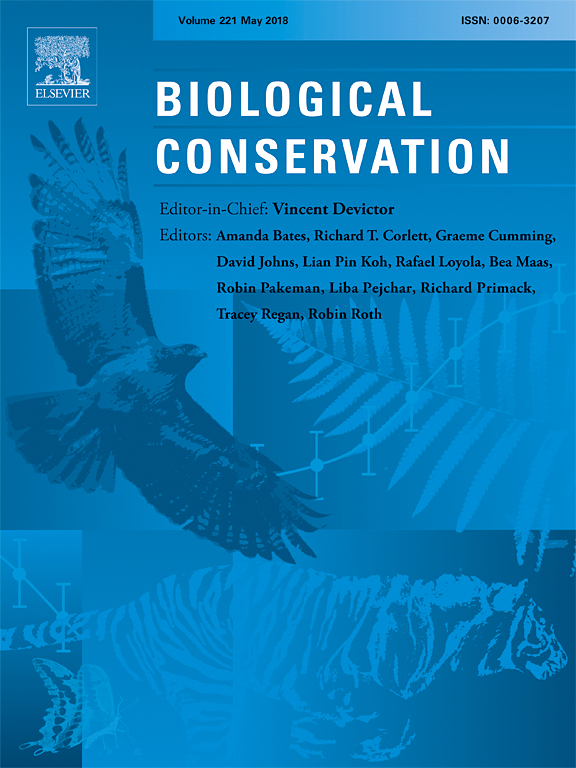 Since the mid-twentieth century, numerous vertebrates and invertebrates have been used as model organisms and become indispensable tools for exploring a broad range of biological and ecological processes. Crayfish seem to be adequate models which resulted in their involvement in research. In the two decades since its discovery, ongoing research has confirmed that the marbled crayfish (Procambarus virginalis Lyko, 2017) is an ideal taxon in this regard, especially due to its almost continuous asexual reproduction providing a source of genetically identical offspring. This review provides an overview of the occurrence, biology, ecology, ethology, and human exploitation of marbled crayfish with primary focus on its use as a laboratory model organism as well as potential risks to native biota in case of its introduction. 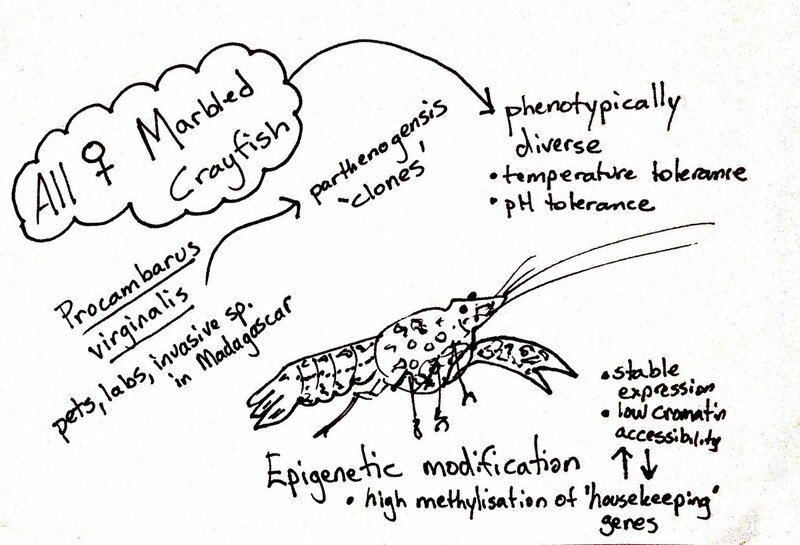 Genetic uniformity, ease of culture, and a broad behaviour repertoire fosters the use of marbled crayfish in epigenetics and developmental biology, as well as physiological, ecotoxicological, and ethological research. Marbled crayfish could be further exploited for basic and applied fields of science such as evolutionary biology and clonal tumour evolution. However, due to its high invasive potential in freshwater environments security measures must be taken to prevent its escape into the wild. De marmerkreeft is een in Nederland exotische rivierkreeft die valt onder de recent inwerking getreden Europese exotenverordening (EU 1143/2014). Van de marmerkreeft zijn uit Nederland tot op heden geen populaties bekend (Koese & Soes, 2011; D.M. Soes eigen informatie). Voor de marmerkreeft is het dan ook van belang nieuwe vestigingen snel te signaleren zodat eventueel maatregelen kunnen worden genomen die verdere verspreiding tegengaan of zelfs eliminatie mogelijk maken. In 2014 en 2015 zijn in het westen van Middelburg (omgeving Hugo de Grootlaan) twee vondsten van mogelijke marmerkreeften gedaan. Eén waarneming betrof een dood exemplaar in een brandgang. Het tweede exemplaar werd levend aangetroffen in een tuinvijver. Verder is er nog een ongedateerde waarneming van een levende kreeft in dezelfde brandgang. Deze informatie was voor de NVWA aanleiding nader onderzoek uit te voeren. de kansen op verspreiding indien zij in het westen van Middelburg daadwerkelijk zou voorkomen. The marbled crayfish is a exotic crayfish in the Netherlands that falls under the recent the European Exotics Regulation (EU 1143/2014) came into effect. There are no populations known to date from the Netherlands (Koese & Soes, 2011; D.M. Soes, unpublished). It is therefore important for the early detection of marbled crayfish in new river branches quickly so that possible measures can be taken to prevent further dissemination or even enable elimination. In 2014 and 2015 in the west of Middelburg (near Hugo de Grootlaan), two possible marbled crayfish were found. One observation was one dead individual in a firebreak. The second individual was found alive in a garden pond. There is also an undated observation of a living crayfish in the same firebreak. This information was further explained by the NVWA conduct research. 3. the chances of spreading if they are in the west of Middelburg. 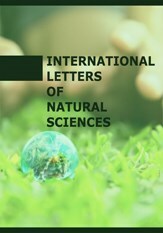 noted in the individual biochemical parameters of marbled crayfish under the influence of manganese, lead and nickel ions. The most significant changes in the activity of lactate dehydrogenase were detected in muscle tissues affected by manganese and nickel ions. 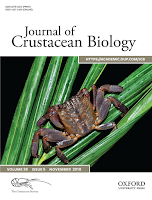 A significant decrease in the activity of succinate dehydrogenase in muscle of marbled crayfish was determined after the action of heavy metal ions. Investigation of changes in the activity of alkaline phosphatase under the influence of the ions of manganese, lead and nickel has its own characteristics, which indicates certain violations in the tissues of cell membranes. Changes in the activity of enzymes were also reflected in the overall protein content. In conclusion, changes in these parameters may indicate a rapid biochemical response of crustaceans to the toxic effects of heavy metals. 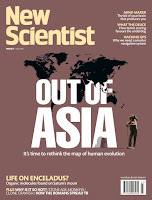 Marmorkrebs make an appearance in the Guardian's Science Weekly podcast as part of a discussion about naming species. If you're super directed, the marbled crayfish discussion with Tim Cockerill starts about 7 minutes in (07:20, to be exact). This podcast raises a question for me, though. What is the preferred pronunciation of “slough”? As in Procambarus fallax, the slough crayfish? The podcast presenter, Graihagh Jackson, has it rhyme with “cow.” I’ve always pronounced with to rhyme with “you.” As this post notes, words ending in "-ough" have a bewildering number of sounds. The Michigan Sea Grant has spearheaded a “#CrayWeek” campaign for the second year in a row! Of course I’m participating. 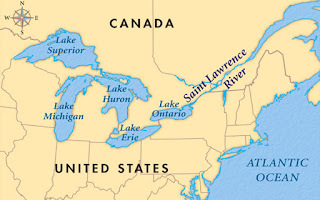 One of the piece of information that Michigan Sea Grant tweeted out was that Marmorkrebs have found themselves on another invasive species watch list, this one for the Canadian / American Great Lakes and Saint Lawrence River. What’s not clear to me from this statment is what action has been, or might be, taken to try to curb the spread of any of these species. A recent paper I co-authored pointed out (Patoka et al. 2018), the track record of legislation on curbing the movement of aquarium pets is... not great. Sometime before 1995, a container of freshwater crayfish from Florida got too hot or too cold en route to a pet shop in Germany. 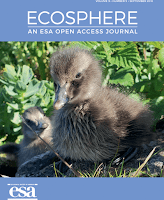 The shock disrupted the development of an egg being carried by one of the females, creating an army of clones that are invading rivers and lakes in continental Europe, Madagascar and Japan. In the field of comparative neuroanatomy, a meaningful interspecific comparison demands quantitative data referring to method-specific artifacts. For evaluating the potential of state-of-the-art imaging techniques in arthropod neuroanatomy, micro-computed X-ray microscopy (μCT) and two different approaches using confocal laser-scanning microscopy (cLSM) were applied to obtain volumetric data of the brain and selected neuropils in Procambarus fallax forma virginalis (Crustacea, Malacostraca, Decapoda). The marbled crayfish P. fallax cf. virginalis features a parthogenetic reproduction generating genetically identical offspring from unfertilized eggs. Therefore, the studied organism provides ideal conditions for the comparative analysis of neuroanatomical imaging techniques and the effect of preceding sample preparations of nervous tissue. We found that wet scanning of whole animals conducted with μCT turned out to be the least disruptive method. However, in an additional experiment it was discovered that fixation in Bouin’s solution, required for μCT scans, resulted in an average tissue shrinkage of 24% compared to freshly dissected and unfixed brains. The complete sample preparation using fixation in half-strength Karnovsky’s solution of dissected brains led to an additional volume decrease of 12.5%, whereas the preparation using zinc-formaldehyde as fixative resulted in a shrinkage of 5% in comparison to the volumes obtained by μCT. By minimizing individual variability, at least for aquatic arthropods, this pioneer study aims for the inference of method-based conversion factors in the future, providing a valuable tool for reducing quantitative neuroanatomical data already published to a common denominator. However, volumetric deviations could be shown for all experimental protocols due to methodological noise and/or phenotypic plasticity among genetically identical individuals. 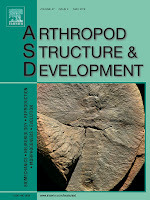 MicroCT using undried tissue is an appropriate non-disruptive technique for allometry of arthropod brains since spatial organ relationships are conserved and tissue shrinkage is minimized. Collecting tissue-based shrinkage factors according to specific sample preparations might allow a better comparability of volumetric data from the literature, even if another technique was applied. I was unable to go to the International Association of Astacology meeting this year, but have been following along on Twitter, using the #IAA22 hashtag. Those following from home have been fortunate to have Maggie Watson sketchnoting many of the presentations, and I can’t resist sharing her Marmorkrebs notes here and here)! If you go to a conference, tweet about it. More people want to attend than can attend. The metolachlor OA is a metabolite of herbicide metolachlor and s-metolachlor. The objective of the present study was to assess the effect metolachlor OA on early life stages of marbled crayfish (Procambarus virginalis). The early life stages of marbled crayfish were exposed for 45 days to three concentrations of metolachlor OA: 4.2 μg/L (environmentally relevant concentration, E1), 42 μg/L (E2) and 420 μg/L (E3) under laboratory conditions. The effects were assessed on the basis of mortality, growth, ontogenetic development, behaviour, oxidative stress, antioxidant biomarkers and histopathology. 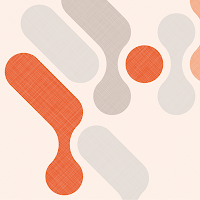 Metolachlor OA caused significantly lower growth, superoxide dismutase, catalase and glutathione s-transferase activity in all tested concentrations. Metolachlor OA in higher concentrations (42 and 420 μg/L) resulted in significantly delayed ontogenetic development, lower reduced glutathione level and lipid peroxidation. Metolachlor OA has not significant effect on behaviour (activity, total distance moved and walking speed). Histological examination revealed alteration of hepatopancreas and gills in crayfish exposed to two higher tested concentrations. Hepatopancreas reflected histomorphological structural changes of individual cell types. Changes of gills included focal hemocytic infiltration together with enlargement of intralamellar space packed with granular substance. In conclusion, chronic metolachlor OA exposure affected growth, ontogenetic development, and the antioxidant system and caused pathological changes in hepatopancreas and gills of early life stages of marbled crayfish. The marbled crayfish is the only obligately parthenogenetic decapod crustacean and a novel research model and invasive animal on three continents. It is regarded either as a parthenogenetic form of slough crayfish Procambarus fallax or as a separate species named Procambarus virginalis. In order to investigate the species question of this unusual crayfish in detail we have identified the similarities and differences in morphology, life history, genetics, behaviour, ecology and biogeography between marbled crayfish and P. fallax. We have investigated specimens from natural habitats, laboratory colonies and museum collections and performed a meta-analysis of our data and published data. Our COI based molecular tree with 27 Cambaridae confirms closest relationship of marbled crayfish with P. fallax. Marbled crayfish and P. fallax are similar with respect to morphological characters, coloration and body proportions, but differ considerably with respect to body size, fertility and longevity. 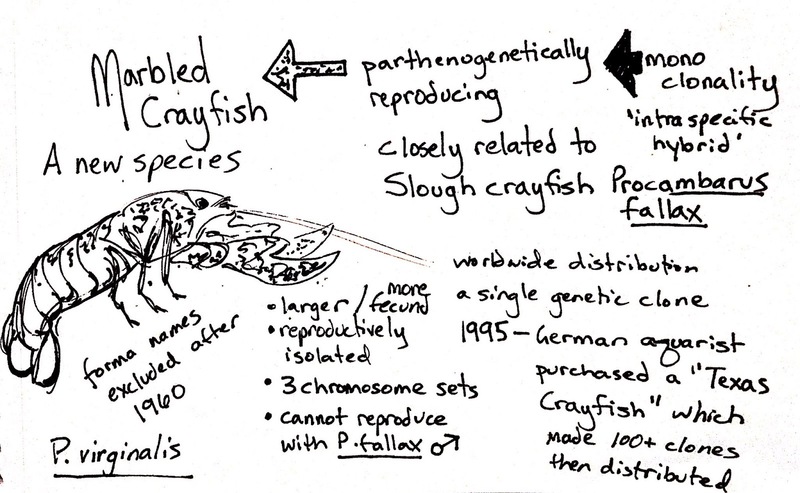 The mitochondrial genes of both crayfish are similar, but some nuclear genomic features are markedly different. Both crayfish are eurytopic and have two major annual recruitment periods, but marbled crayfish show different population structure and higher invasiveness. Marbled crayfish occur in boreal to tropical habitats of Europe, Madagascar and Japan, but P. fallax is confined to the subtropics and tropics of the southeastern USA. Laboratory experiments suggest reproductive isolation of both crayfish. 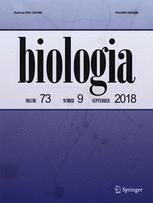 The application of the Evolutionary Genetic Species Concept for asexuals to all available data supports raising marbled crayfish from "forma" to species rank. A determination key is provided to discriminate Procambarus virginalis, the first asexual decapod species, from its most likely parent species P. fallax. neither empty their glair glands nor spawn. Their glands persisted for an unusually long period of time and disappeared only during the next moult. 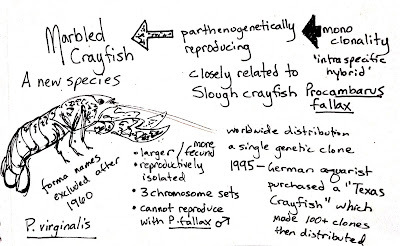 Apparently, slough crayfish females use information on sperm availability to either spawn or save the resources. Females of marbled crayfish, Procambarus virginalis, a parthenogenetic all-female descendant of slough crayfish, developed glair glands in approximately the same periods of the year but generally spawned despite of the lack of males. These findings suggest that in marbled crayfish glair secretion and spawning is decoupled from mating. Therefore, the species pair P. fallax and P. virginalis seems to be particularly suitable to investigate the regulation of spawning in freshwater crayfish. 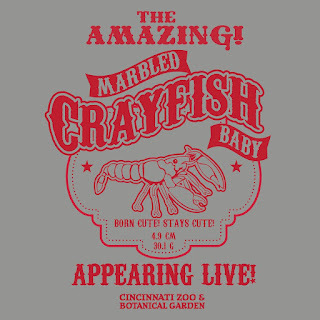 Marbled crayfish are featured in this year’s Cincinnati Zoo’s Zoo Babies display! The Zoo’s website shows they are part of the display, but no more. I do complement their photographer for the particularly cute crayfish pic (above) on their site. There’s a very nice shirt available. Unfortunately, it’s doesn’t seem to be available in adult sizes. Based on the description in the display, I think these are the sexual slough crayfish and not Marmorkrebs. But it’s fun to see crayfish on display nevertheless! The non-indigenous crayfish Faxonius immunis (Hagen) is the dominant crayfish species at the Upper Rhine River system since his detection in 1993. As an invasive alien species, it is one of the biggest threats to aquatic biodiversity in the area. By dispersing over land, the species has a high potential to colonize small ponds created for threatened amphibians and dragonflies. Shortly after invasion, the fast growing population of F. immunis is changing the habitat drastically. 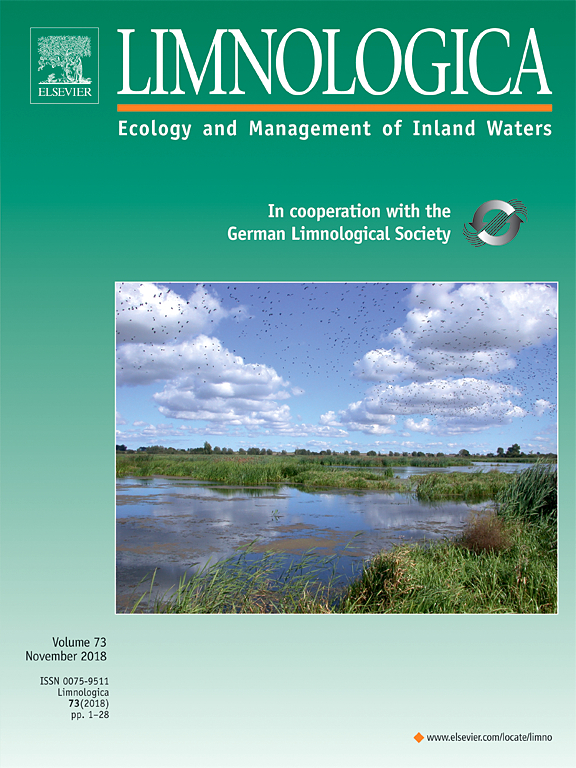 In June 2016, our team started a local information campaign including citizen science project where the local people south of Karlsruhe, Baden-Wuerttemberg, Germany, could contact us when they spot a crayfish migrating over land to assess the activity of overland dispersal on a regional scale. Until January 2018, we got a total of 98 responses. Thirty-nine include suitable information including 33 records of overland dispersal of F. immunis. The species was recorded on land throughout the year, except February and July. Additionally, single observations of overland dispersal of other invasive crayfish species, naming Procambarus clarkii (Girard), Pacifastacus leniusculus (Dana), Procambarus virginalis (Lyko) and Faxonius limosus (Rafinesque), were recorded. Wait a second, I’ve lost count. Eleventh European country where Marmorkrebs have been found in outdoors. This is according to a press release from the Estonian Research Council. The crayfish were collected last year, not recognized as Marmorkrebs until the end of the year, and a repeat visit at the end of May confirmed a population was there.